The UWP Scheduler control (Event Calendar) has capabilities like Outlook calendar to create, delete, edit, and display appointments. It supports five different view modes: day, week, work week, month, and timeline. Built-in appointment editor to manipulate the appointments. Built-in context menu for improving the end-user experience. Appointment rescheduling through resizing and dragging and dropping. Restricting navigation beyond specified minimum and maximum dates. Localization to meet the needs of different regions. In addition to default schedule appointments, users can use their own collection and bind a business object to an appointment. This is done by mapping its fields such as start time, end time, subject, notes, and recurrence. Any type of IEnumerable data binding is supported. Appointments provide information about events to occur at specified times. Recurring appointments - Recurring appointments are used to repeat events on a regular basis. It supports daily, weekly, monthly, and yearly recurrence patterns. 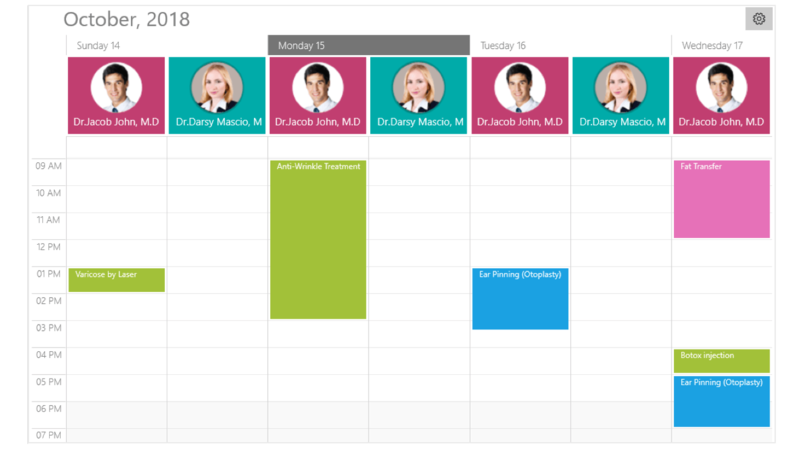 All-day and spanned appointments - Show appointments that occur over an entire day and spanned appointments that last more than 24 hours in a separate panel. Time zones - Display appointments created in various time zones in the system time zone. Appointment start and end times are also automatically adjusted and displayed based on daylight saving time. Appointment customization - Add different views such as images and text for each appointment. Reminders - Send alerts at specified times to remind you of appointment. Define resources based on associated appointments with grouping support. Headers will also be displayed based on the defined resources and sub resources. Selection - Select timeslots and appointments through mouse and touch interactions. Navigation - Navigate to schedule views using touch swipe gestures and navigation buttons. Schedule also supports programmatic navigation. Bring the required timeslot into view in day, week, workweek, and timeline views. Date restriction - Prevent navigation beyond a specified minimum and maximum dates. This restricts users from selecting certain dates or creating appointments. Blackout dates - Disable interactions and selections for certain dates. This is helpful for blocking user interaction during holidays or any other special events. Blocking timeslots - Prevent user interactions, such as adding appointments in specific time slots. A friendly user interface lets you perform various operations using the context menu and editor. Appointment drag-and-drop - Easily reschedule an appointment by dragging it from one timeslot or month cell and dropping it into another timeslot or month cell. Context menu - Use provided default user interface for adding, editing, and deleting appointments. You can also reschedule, copy, and paste the appointments. You can also use a custom context menu. Appointment resizing - You can quickly extend or reduce an appointment’s start and end time by resizing. Built-in appointment editor - You can easily create, edit, or delete appointments using the built-in appointment editor. Globalization - Display date-time formats and headers in different cultures, meeting the needs of different regions. UWP Scheduler supports to change the first day of the week. Localization - Localize all static text in the UWP scheduler to a particular language.